Mary Rutan Hospital Sports Medicine provides certified athletic trainers to area high schools. Our trainers act as a liaison between student athletes, parents and coaches to assure the highest level of safety for the athlete. The primary goals of certified athletic trainers include injury prevention as well as safe and efficient return to previous competitive levels following an injury. They work in conjunction with other health care providers such as primary care physicians, emergency departments, orthopedic surgeons and physical therapists to coordinate continuity of care in an athlete’s treatment plan. Certified Athletic Trainers are an integral part of Mary Rutan Hospital’s Rehabilitation and Sports Medicine departments providing evaluation, management and treatment of injury. Each athletic trainer provides game and practice coverage, athletic training room administration, and care of immediate medical needs when an athlete is injured. Trainers also provide guidance and assistance to coaches during preseason conditioning and throughout the season. 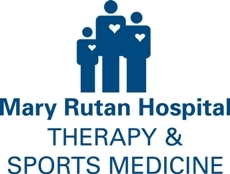 The Mary Rutan Hospital Sports Medicine Program is designed specifically to meet the needs of athletes. For sports injuries, physical therapy offers an opportunity to minimize lost playing time and optimize the return to performance. In addition, we offer personalized sport training through the STAR Program, this individualized sports enhancement program is designed to improve sports performance as well as decrease the risk of injury. Our physical therapists and certified athletic trainers have over 100 years of combined experience in enhancing sports performance and treating sports injuries. Ongoing communication with the athlete, families, physician and coaches to help ensure appropriate intervention. Our new state-of-the-art facility is located at 1134 N. Main Street in the new Mary Rutan Health Center. Our new facility provides the area's newest and most advanced training space. We offer aquatic therapy, turf and court simulated training space and advanced equipment. Private rooms are available for detailed evaluations and treatment when more privacy is required. This comfortable, well-designed space allows the most effective treatment for athletes as they return to desired activities. Run by our three athletic trainers, the STAR Program was established for athletes who are in the pursuit of excellence, with the goal to improve sports performance and decrease the risk of injury. Designed as a Sports Training program to promote Athletic Results (STAR), the sport-specific enhancement program focuses on improving power, speed, agility, strength and skill. This is accomplished by utilizing a variety of cutting edge training techniques which may include but are not limited to plyometrics, resistance speed training, various agility tools, strength training, core strength routines, Olympic and power lifts, medicine ball exercises, Vertimax routines and flexibility routines. Registration and payment information is available by calling 937.593.0822. The Center for Disease Control statistics suggest that over 200 sports related concussions occur in Logan County every year. Of these sports related concussions, more than half go undiagnosed. This may be due to the fact that most sports related concussions occur without loss of consciousness. Appropriate diagnosis, management, and education are critical to helping young athletes with a concussion recover quickly and completely. The long term effects of repeated sports-related concussions have recently received significant attention in the media due to emerging neuroscience in this area as well as recent reporting on the plight of college and professional athletes who have experienced multiple concussions. The goal of the Logan County Concussion Clinic is to work closely with local physicians in assisting their young patients who have been diagnosed with concussion, to return safely back to school as well as to sport. Appropriate concussion management is critical to avoiding re-injury or prolonged recovery. Our assessment and treatment protocol utilizes the latest research regarding treatment and recovery of individuals with concussion who participate in competitive sports. View the full list of providers.